One way or another, flights to Europe are going to be cheaper. Norwegian Air recently unveiled $65 one-way fares on some trans-Atlantic routes and now JetBlue says it is doing a "major review" of its fleet with an eye towards European flights. Air Canada's CEO, meanwhile, says he thinks President Trump's plans to cut taxes and regulations will be good for U.S. carriers but won't hurt his company's growth prospects. New York-based JetBlue must decide whether it thinks it can profitably fly the Airbus A321LR (the LR stands for "long-range") from the East Coast to the United Kingdom and perhaps other Western European destrinations, according a report in Skift, an industry newsletter. JetBlue and other airlines recently inaugurated service to several destinations in Cuba, only to scale back after passenger levels were below expectations. JetBlue CEO Robin Hayes said the decision boils down to whether it can make a higher rate of return flying the aircraft to Europe than to other destinations. JetBlue has lately been making waves in the transcontinental market with its Mint business class cabin, which features lie-flat seats and other amenities at lower fares than those offered by legacy carriers. 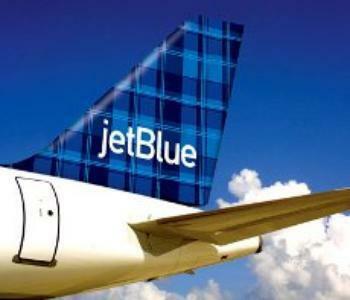 Even road warriors who have elite status on other carriers have switched to JetBlue for coast-to-coast flights because of the cut-rate premium class, according to a recent Wall Street Journal report. Hayes made the comments Tuesday at the J.P. Morgan Aviation, Transportation & Industrials Conference in New York. Canadian airlines have been working to increase their trans-Atlantic business by routing passengers -- including many from the U.S. -- through their Toronto and Vancouver hubs. But Air Canada's CEO says the Trump Administration's plans to cut taxes and regulations may make it harder for Canadian carriers to compete. "The U.S is about to become even more competitive," Calin Rovinescu said in a Bloomberg report. He said Canadian carriers will be hurt if Canada proceeds with plans for a carbon tax and if a plan to privatize airports raises costs. Trump has said he wants to rework the North American Free Trade Agreement (NAFTA) but Rovinescu says he doesn't expect any changes to hurt Air Canada.